Manchester City are getting better and better and will make a "huge step forward" in the coming months, manager Pep Guardiola says. 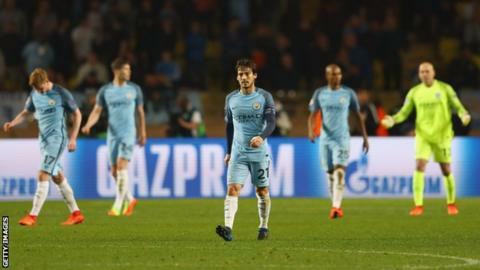 City were eliminated from the Champions League last 16 by Monaco in midweek and trail leaders Chelsea by 10 points in the Premier League with 11 games left. Guardiola reaffirmed his commitment to City ahead of Sunday's home game with Liverpool (16:30 GMT). "I have more power than ever to shape the squad," he said. Guardiola said he had received a text message from City chairman Khaldoon Al Mubarak in the wake of the club's 3-1 defeat to Monaco on Wednesday. "I was really impressed by his reaction, I respect him a lot," added Guardiola, whose only hope of ending his debut season with a trophy is by winning the FA Cup. City face Arsenal at Wembley in the semi-final on 23 April (15:00 BST). Guardiola added: "In the next month and a half I expect a huge step forward. The club is getting better and better. Next season will be better." The Spaniard denied reports he was planning a mass clearout at the end of the season. "We will try and improve the team." Liverpool are unbeaten against the Premier League's top six this season but Reds boss Jurgen Klopp believes that record is under serious threat this weekend. Third-placed City start the weekend one point and one place above the Reds in the table, who have played one more game. "We've felt good in these games [against the top six] so far but for me City is the most difficult team to play," said Klopp on Friday. "It's real football, difficult to defend." Klopp is a big admirer of Guardiola, the two having managed in the Bundesliga at the same time, for Borussia Dortmund and Bayern Munich respectively. "I am not in doubt about his quality," added Klopp. "Maybe a few people are but I am not. I respect him a lot. I've played against him a lot and I can say it is quite difficult to play his teams." Pep Guardiola might have pinned the blame for Manchester City's Champions League exit on his strikers on Friday and he might have rejected the idea he will make wholesale changes to his squad this summer. But there is no doubt his defence will look very different in 2017-18 to how it is now. Of his four full-backs, only Aleksandar Kolarov has a contract beyond the end of this season. It is not beyond the realms of possibility all three will go but Gael Clichy and, maybe, Pablo Zabaleta, are likely to make it at least two. And what of skipper Vincent Kompany, who has featured for 127 minutes since 26 October? He is now fully fit and could not even get a place on the bench for the recent games at Middlesbrough and in Monaco.